BRIGHTON COLLECTIBLES. NECKLACE & BRACELET MATCHING SET.MORE BEAUTIFUL THAN IN PHOTOS. Many colors. turquoise, gold, silver, brown, black. BRIGHTON COLLECTIBLES. LONG NECKLACE & BRACELET MATCHING SET. BRIGHTON COLLECTIBLES. NECKLACE BRACELET & EARRINGS MATCHING SET.MORE BEAUTIFUL THAN IN PHOTOS. PRE-OWNED, EARRINGS NEVER WORN. Brighton 16"+ Necklace 7 1/2"+ Gold Silver Bead Station Bracelet Jewelry Set! Condition is Pre-owned but lots of wear left. 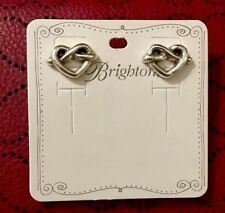 Included with set Brighton Heart bag. Brighton Rhinestone Necklace Bracelet Set Of 2. I think it’s the Toledo collection. Condition is Pre-owned but plenty of wear left. Brighton Pebble Long Necklace and Hoop Earrings. Condition is Pre-owned. Shipped with USPS First Class Package. Our version is abundant with hearts, and reverses from all silver to two-tone! I AM NOT AN AUTHORIZED BRIGHTON DEALER OR REPRESENTATIVE AND AM NO WAY AFFILIATED WITH BRIGHTON. I ONLY BUY THEIR PRODUCTS BECAUSE I LIKE BRIGHTON PRODUCTS. They are pre-owned and in Excellent Used Condition. Brighton Silver Tone with brown cord and multi colored MOP, glass, and wood beads multi strand necklace and bracelet set. The necklace is 20” long and the bracelet measures up to 8” long. This set is in very good pre owned condition. Brighton Faux Pearl Roman Coin Gold Silver Necklace Bracelet Earrings Lot! Brighton Heart Earrings & Bracelet Set. Pre-owned in good condition. Shipped with USPS First Class Package. The Necklace is 16" to 18" with 1 1/4" drop. They are pre-owned and in Great Used Condition. BRIGHTON DECO LACE TRIO NECKLACE BRACELET EARRINGS PARURE SET Rectangle EUC 3pc . Condition is Pre-owned but excellent. 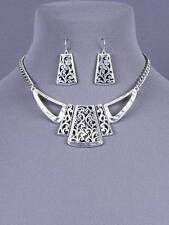 Meridian Brighton Earring And Necklace Set. Condition is Pre-owned. Shipped with USPS First Class Package. Necklace measures 20.5 inches. Never worn. Actual color could vary from the color your screen shows or from the flash/lighting when taking the photo. For Lower 48 US States, ONLY. No exceptions. No personal checks. The above pictures show the actual item you will receive. Brighton Heart Necklace And Heart Bracelet W/sayings. Great condition. BRIGHTON INTRIGUE Black Silver Hinged OVAL BANGLE Bracelet & Necklace Lot. Condition is Pre-owned. Shipped with USPS First Class Package. There are some scuffs on the bracelet, please see photos. The necklace was only worn twice. Pouch included. 28"-31" adjustable with a lobster claw clasp closure and features swarovski crystal accents with a 1" drop and is 3/4" wide. The turtle is encrusted with swarovski crystals and sits atop a large pearl bead and a small swarovski crystal dangles next to the pendant. 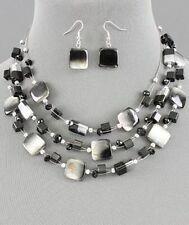 Brighton Necklace and Earrings Set- Lightweight Contemporary Design! Brighton Necklace and Earrings Set- Lightweight Contemporary Design!. Condition is Pre-owned. Shipped with USPS First Class Package. This is from my own private collection - may need some cleaning/polishing, as I did wear Brighton everyday at the office ! Thanks for stopping and looking! Brighton Purple Jewel Necklace And Earrings. Condition is Pre-owned, but mint condition. I AM NOT AN AUTHORIZED BRIGHTON DEALER OR REPRESENTATIVE AND AM NO WAY AFFILIATED WITH BRIGHTON. I ONLY BUY THEIR PRODUCTS BECAUSE I LIKE BRIGHTON PRODUCTS. Inspired by the exotic island of Bali, this romantic sculpted jewelry will capture hearts everywhere you wear it! Very versatile Brighton earring and bracelet set. Multicolor design pairs perfectly with anything. Bracelet is 7" - 8" long. Beautiful Brighton Scroll Necklace adorned with crystals for the perfect amount of sparkle and bling! Brighton Tin is for display only. The earrings are stamped 925 Sterling at the top. Very feminine with nice bling! BRIGHTON SPECTRUM BANGLE BRACELET & NECKLACE SET. Stunning bracelet features channel set Swarovski crystals in shades of Blue. Gorgeous piece. 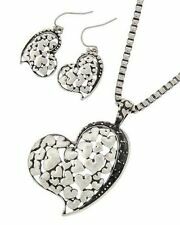 NWT Brighton GLISSANDO Wine & Silver Crystal Heart Necklace & Earrings Set $166. Condition is New with tags. Shipped with USPS First Class Package. Brighton Tin is for display only. (I’m retired and do not need so much stuff. Beautiful Two Tone (Silver-Gold) Three Ring Reversible Etched Pendant (~1.25” Drop) on ~18” Necklace with lobster claw closure. ). Inspired by the Milagros of the Southwest, this sacred heart necklace features Blue Picasso Jasper beads, a lustrous two-tone finish, and Swarovski crystals. As a symbol of faith, it is an instant heirloom! Luminous in their beauty, smooth spheres of blue lace agate are elegantly punctuated by stations of pave Swarovski. The twisted rope chain gives this piece a modern, fresh touch. New ListingBrighton TWINKLE Necklace and Earring Set clear Swarovski NWT Discounted! Th is i s a be au ti fu l necklace/ ea rr in g se t fr om t he B ri gh to n Tw in kl e Co ll ec ti on ! I h av e di sc ou nt ed o ve r 10 % wi th free sh ip pi ng. T he necklace is c ur re nt ly s ol d ou t online. Look closely at its bail, and you'll see the Celtic knot itself. It hangs upon a lariat style leather cord that can be adjusted to be worn long or short. necklace only. Finish: Silver plated. Length: 25". 28"-31" adjustable with a lobster claw clasp closure and features swarovski crystal accents with a 1" drop and is 3/4" wide. The octopus is encrusted with swarovski crystals and sits atop a large pearl bead and a small swarovski crystal dangles next to the pendant. Very nice, pre-owned Brighton necklace w/pendant and matching earrings for pierced ears. Necklace has an extension chain. Earrings are dangles. Colors are pink, orange and green flowers. Brighton “Trust Your Journey” Necklace and Bracelet Set **New, multi color. Up for your consideration is a beautiful multi-colored Brighton crystal necklace and bracelet set. The bracelet is approx. 7.5" long with fold over clasp. The necklace is approx. 18" long with 3" extender. French Wire Earrings feature a 1 1/2" drop and are 1" wide with a matching design to the necklace. Displays not included. I AM NOT AN AUTHORIZED BRIGHTON DEALER OR REPRESENTATIVE AND AM NO WAY AFFILIATED WITH BRIGHTON. I ONLY BUY THEIR PRODUCTS BECAUSE I LIKE BRIGHTON PRODUCTS. It's glorious with a German glass cabochon stone and crystals. Matching Brighton necklace and earring set! Necklace full length 18.5" adjustable with lobster claw clasp. Displays not included. The pendant has a 1 1/4" drop and is 7/8" wide. Brighton TWINKLE Necklace and Earring Set clear Swarovski NWT Discounted!